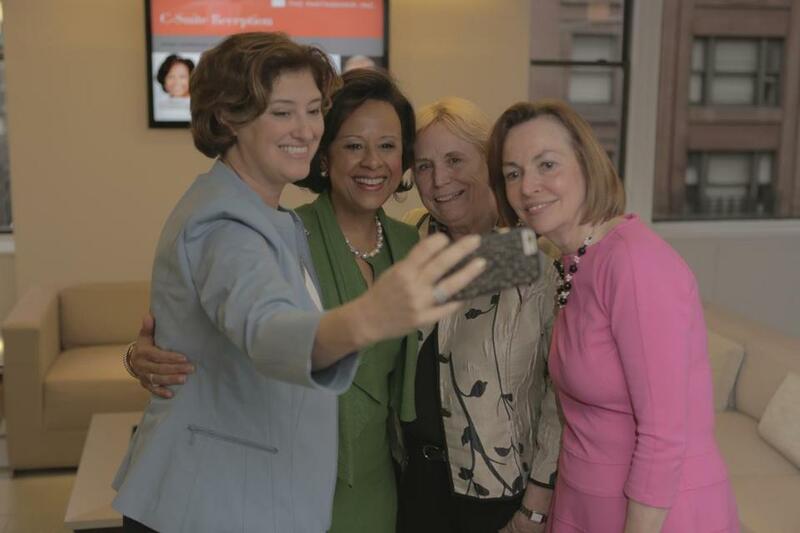 Dr. Laurie Leshin, president of Worcester Polytechnic Institute; Dr. Paula Johnson, president of Wellesley College; Margaret McKenna, former president of Lesley University and Suffolk University; and Gloria Larson, former president of Bentley University. More than half of Massachusetts college students are women, and women earn the majority of doctoral degrees. But while nearly half of all private college presidents are women, just one of the 15 state universities has a female president, according to a new study released Wednesday. Men are still in charge of the vast majority of college boards of trustees, however. Women lead just 20 percent of all the boards, including 31 percent of the boards of private colleges. The number of women presidents has plummeted among public state universities and stagnated among private colleges and universities, according to the report, which was produced by the Center for Women in Politics and Public Policy at the University of Massachusetts Boston on behalf of a private foundation. The Eos Foundation, the philanthropic foundation that funded the study, said it hopes the report will pressure private colleges and public officials to diversify their leadership. Governor Charlie Baker’s spokeswoman Elizabeth Guyton said the governor and lieutenant governor “strive to increase diversity in the higher education system,” are pleased with the appointments they have made, and look forward to reviewing the report. The state’s higher education commissioner said the report shows there is work to do. “We’re going to work with Eos and campus leaders to continue to diversify the leadership corps of our public colleges and universities,” said Carlos E. Santiago, who plans to speak on a panel Thursday morning about the results of the study. While Baker appoints board chairs for UMass and community colleges, state university boards appoint their own chairs. The data suggests Baker has already made gender parity a priority: Fifty-three percent of the 199 trustees Baker has appointed to community colleges and state universities are women, according to the state Department of Higher Education. The report ranks all Bay State colleges and universities based on the number of women in senior leadership. Many of the schools at the top are women’s colleges or former women’s colleges. Simmons College, a women’s school that accepts male graduate students, had the best record of female leadership; other standouts include Smith College, Emmanuel College, and Mount Holyoke College. Near the bottom of the list are Boston College, Boston University, Tufts University, and the Massachusetts Institute of Technology. Remarkably, even though women in higher education are making progress nationally, they’re falling farther behind in Massachusetts, the study found. In 2006, women held 23 percent of college presidencies nationwide; by 2016, that number had increased to 31 percent. In Massachusetts, meanwhile, the number of women presidents dropped — from 35 percent to 31 percent — in roughly the same time frame. Just five of the 94 current presidents of Massachusetts institutions represented in the study are women of color, according to the report. California and New York outdo Massachusetts in parity for women and for women of color, the study noted. Women make up half the chancellors in the California State University System, and 16 percent are women of color. The study recommends strategies for equalizing the gender balance at the top of the sector, including filling board vacancies with women and requiring unconscious bias training. The report also includes specific recommendations for the public higher education system — in particular the state Board of Higher Education, which oversees all public colleges other than the UMass system — to make gender and racial parity a priority. It suggests that the state board select college and university presidents, rather than leaving leadership decisions to local boards of trustees. It also suggests the governor choose the board chairs of all public institutions, and that the Board of Higher Education’s membership reflect the state’s racial and gender demographics. The data raises the question of whether there may be a “glass ceiling” that prevents women from advancing all the way to the top. The study found that women represent 47 percent of provosts and 52 percent of deans, positions that are often stepping stones to the presidency. Silbert said it is imperative that leadership include a diversity of lived experience to keep up with the fast-changing times in the industry. The foundation plans to publish annual college rankings based on gender parity and publish another full study every three to five years. Silbert said her foundation hatched the idea for the study after Salem State University last year chose a white male former state legislator as its next president over a female candidate from out of state. The new president replaced a woman, Patricia Maguire Meservey, as the school’s longtime leader. Margaret McKenna, the longtime president of Lesley University who served on an advisory committee for the study, said the results are not surprising, but disappointing nonetheless. McKenna also served briefly as president of Suffolk University, where she clashed with a male-dominated board of trustees who pushed her out a year after giving her the job. Clarification: This story has been updated to include the increased percentage of women leading community colleges since the time the data for the study was collected.